I thought I’d publish an interview, in the interests of being transparent. Journo: Hello PF, nice of you to give me a few minutes before the final today. Journo: How are you feeling ahead of the final? Me: Fine thank you, how are you? Journo: Um, I’m fine too I suppose. 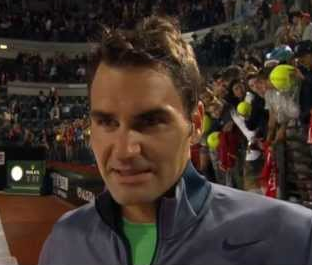 I think what I meant was, how do you feel about your chances playing against probably the best clay court player of all time? Me: I said yesterday after the match about Nadal, “He is the best mover on clay of all-time, if not Top 2 with Bjorn Borg… “. I didn’t say he was the best player. Journo: So you perhaps still think that even though he has beaten Borg’s record, he is still level with Borg at number 2? Journo: If they are both number 2, then who is number one? Me: Do you really have to ask? Journo: You have also beaten Borg’s record but on grass, so using your logic, does this mean you are maybe also equal to him on grass and you’re both number2? Journo: How have you prepared for today’s match? Maybe watched a few DVDs of past matches against Nadal? Me: That’s the last thing I’d do. Journo: Andy Murray may not play at Roland Garros, how do you feel about that? Me: Andy is a great player and it’s always tough when you have an injury so I hope he recovers quickly and we see him in Paris. Journo: If Andy is in Paris, it’ll increase the chances of Djokovic and Nadal being on the opposite side of the draw to you, like here in Rome. Is this partly why you want Andy there? Journo: Lastly, you often say that it’s up to you whether you win or lose a match. Do you think you’ll choose to win today? Me: I always make that decision nearer the end of a match, I’ll let you know afterwards. Journo: Thanks again and good luck! Me: Good luck to you too. did You by any chance fly over to Supergran to join in the festivities yesterday and forgot about showing up at Mr. Empire’s today? Otherwise it must have been the new hairdo. I think there is just enough time to grow it back before Paris.